Broadcast legend Larry King celebrates his 50th anniversary on the air this year and after all this time his CNN show "Larry King Live" still features some of the most coveted interviews. CNN will celebrate in April with "King-Sized Week," which includes a two-hour pop culture special, a roast and a special edition of "Larry King Live." 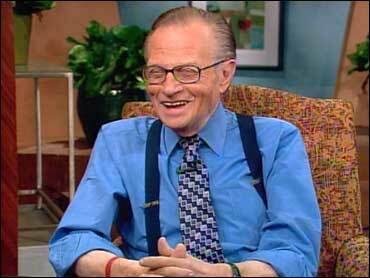 "It started May 1, 1957, on a little radio station in Miami," King told The Early Show co-anchor Harry Smith. "But I still pinch myself … I can't believe, 50 years. I don't feel that old." King said his best guests of all time were Martin Luther King, Malcolm X and Frank Sinatra — "Now I have to show off," he added. King said people agree to come on his show because they know they will be treated fairly rather than "dragged to the wall." "I don't use the word 'I' ever," he said, "because the guest counts, not me. I will be back tomorrow. I want them — I want to learn everything I can about them. They know that hopefully that camera or that microphone will disappear. I never had an agenda. I never went on the air saying, 'Boy, I can't wait to get this guy.' You see a lot of it but it's not my speed." It's his friendly approach that puts people at ease and prompts them to start talking about much more than they ever intended. For example, on King's show, former New York City Mayor Rudy Giuliani announced that he would run for president. King is also involved in the book "Beyond a Reasonable Doubt," for which he wrote the introduction. The book boasts 80 different contributors who reflect on what the "beyond a reasonable doubt" standard really means and how it is applied in criminal cases. King said he and some friends were discussing the principle and its nuances. King said the definition of reasonable doubt can vary from person to person, yet it is the standard by which people's fates are sealed. Too often, King said, it fails when an innocent person is sent to prison. "For example, you follow the Scooter Libby trial, you look at it one day and do I have a reasonable doubt as to who talked to whom about what?" King said. "I could say I do, you could say you didn't and we could both be, in a sense right, because it's so subjective."